Marion Caroline Oliveri, (née Verlini) 99, formerly of Northvale, NJ and Florida, went to be with her Lord on April 8 surrounded by her loving family. Beloved wife of the late Anthony Oliveri Sr. they shared 50 years of marriage. 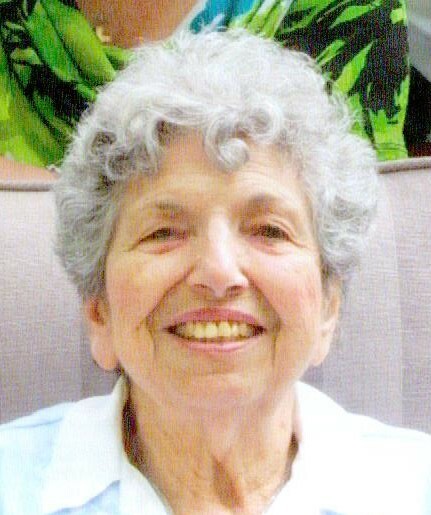 Marion was the devoted mother of Anthony Oliveri Jr. (Jane), Loretta Bleier (John), proud grandmother of Lisa Vreeland (Kurt), Jesse Keegan, Dana Oliveri, and Blake Bleier adoring great-grandmother of Ryan Vreeland, loving sister-in-law of Patricia Oliver, and warmhearted supporter of many nieces, nephews and extended family which she cherished. She was the loving sibling of the late, Elizabeth D’Arcy-Clarke, and Richard Verlini II, and broken-hearted great-grandmother of predeceased Robert J. Vreeland. Born March 18, 1920 in Teaneck, New Jersey Marion was the daughter of Emma (née Manzo) and Richard J Verlini Sr. She graduated from Teaneck High School in 1937 and secretarial school on Wall Street in 1938. Always a valued employee, her favorite position was serving and being surrounded by children in the Northvale Public Schools where she was secretary from 1963-1984. Marion an active member of her community, she was a member/volunteer for many organizations. True to who Marion was she left detailed files for her passing including lists of the many organizations she served and positions she held. They are recounted here, from her own words and recollections: Cub Scouts and Girl Scout leader; Northvale Ambulance Corps (1961-1971); Eucharistic minister and Social Concerns Committee both of Saint Anthony’s Parish in Northvale (where she started the tree of life in 1987) and Saint Michael the Archangel in Hudson Florida; PTA president Nathan Hale School Northvale; President of Norwood/Northvale Woman’s Club; Membership Chairman of the NJ Federation Woman’s Club; Hospice Volunteer 10 years; Bayonet Point Hospital Volunteer 10 years; President of the Northvale Golden Age Club (instituted parliamentary procedure); Treasurer, Golden Age Club; election Board; Red Hats Club;Volunteer at the Vietnam Wall experience in 2002; vice president to the Estate Homeowners Association in Florida, head of travel trips/cruises for seven years; Usher River Edge High School activities 10 years; started canasta club at Ridgecrest; Westside Presbyterian Church knit/ crochet shawls for people in need Including Veterans Homes. Participated in Walk at Work Day. Marion’s joy in life was her family. Her family felt her most endearing quality was making everyone feel welcome in her home. There were no strangers at Marion’s table; everyone became family. She will be well remembered for her huge trays of Christmas cookies. A funeral mass will be held on Tuesday, April 23 at 10 AM at Saint Anthony’s Church in Northvale with entombment to follow at Garden of Memories, Paramus. Visiting hours are Monday, April 22, 2-4 & 7-9 PM at Pizzi Funeral Home 120 Parisi Ave. Northvale (201-767-3050). Memorial donations, in lieu of flowers, may be made to “Robby’s Rabbits”. Founded by Marion’s granddaughter Lisa and her husband Kurt in memory of their son, Robby. “A happy heart makes the face cheerful.” (Proverbs 15:13) All will remember Marion’s most noted attribute, her beautiful smile shining from her happy heart. At Marion’s request, please be joyful and celebrate with her family her long life, well lived. Her family thank and acknowledge all the caregivers and staff from the Emerson Healthcare and Rehabilitation Center, they took such wonderful care and truly became part of her family for the last 3 1/2 years. We also thank everyone who has walked this life path with Marion, each one of you brought your own sunshine to her life. Let us all smile a little more whenever we think of her. Sincerest sympathies to Marion’s family. We have the fondest memories of her years at Northvale Public Schools and devotion to the community.